One of the questions that I most often hear these days relates to whether or not a new housing bubble is forming in Tallahassee. 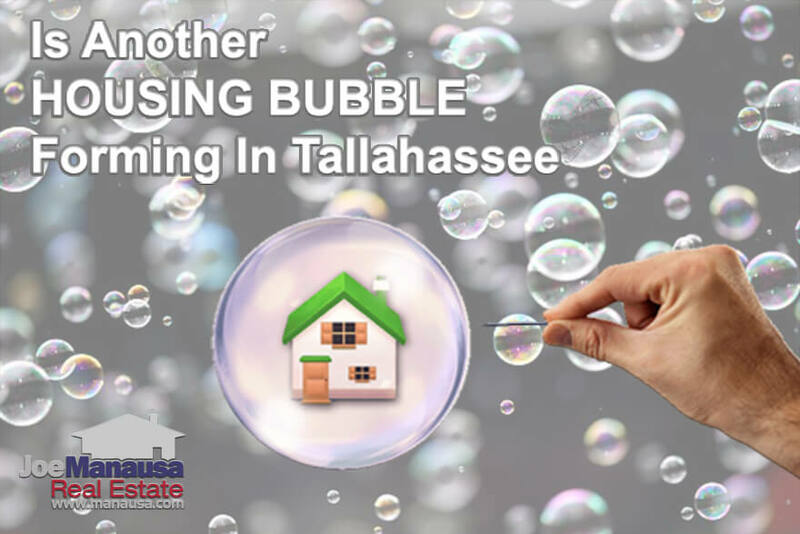 Observant Tallahasseans are noticing sky-rocketing home prices and those with good memories (or solid memories of bad times) are concerned with the prospect of a new bubble and what that could mean for Tallahassee. Fortunately, I have a detailed answer to this question, as well as a video of my presentation to the Tallahassee Chamber of Commerce on this very subject. I was asked to speak at this year's annual Chamber retreat (which was held last weekend in Amelia Isand) on the subject of residential real estate in Tallahassee. As is often the case these days, the biggest concern was whether or not a housing bubble was forming (again). Here is what I had to say. 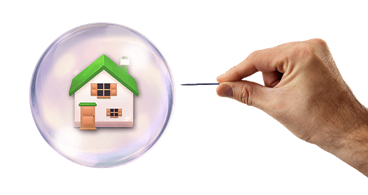 How Does A Housing Bubble Form? A housing bubble is formed when the supply of homes for sale continues to rise while the demand for these homes is declining. A classic case of this was experienced in Tallahassee back in 2006. The market was artificially inflated with demand from investors who had shifted the bulk of their wealth from mutual funds (after the tech bubble burst in 2000) to their local real estate markets. 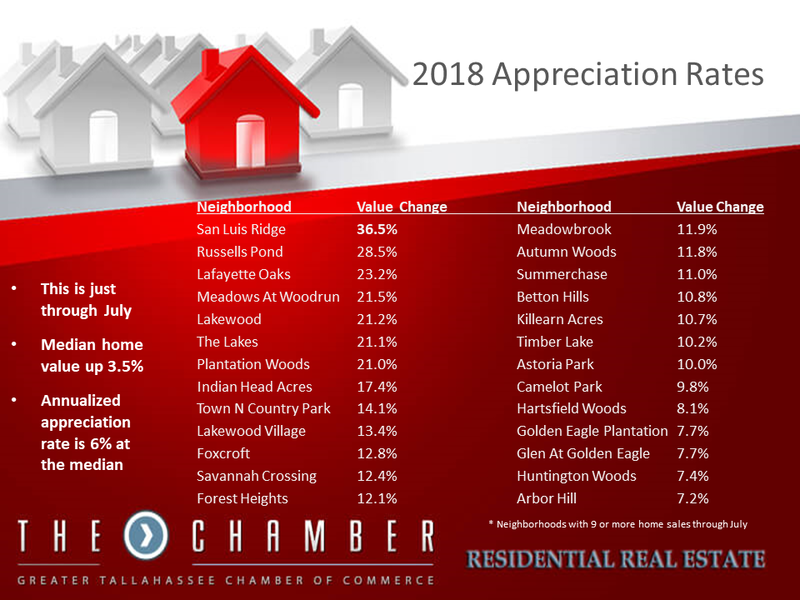 Compounding this, a few magazines highlighted Tallahassee as one of the best real estate investment markets in the US, thus we saw speculative building hit levels never before seen in our area. The result was a construction industry developing land and producing homes at unprecedented rates, and consumers buying more homes than they could use (in order to flip them for profits). All of this came to a head in 2005, and demand began to slow. 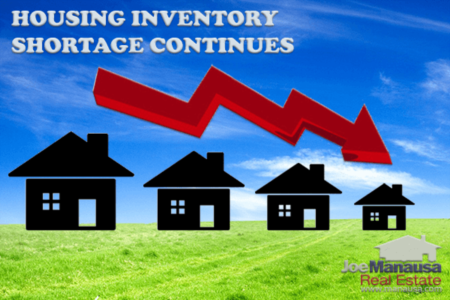 As is often the case in most markets, the supply side was slow to respond to the changing demand side, and we saw inventory begin to stockpile. This is a classic case of a bubble, and in 2006, the bubble burst. Tallahassee went from a vibrant market to one that slowed to 1/3rd the level seen at the peak of the market. There were a glut of unneeded homes that took nearly eight years to consume. The easiest way to answer the question posed in this post is to study the current supply and demand for homes. 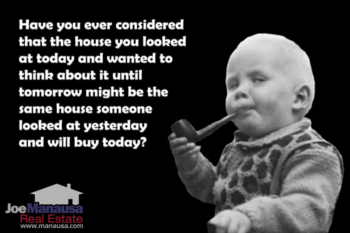 If inventories are on the rise, and demand is beginning to fall, then we know that further production of new homes is going to created another housing bubble in the Tallahassee real estate market. The graph above is fairly busy, but it contains a wealth of information that can answer our housing bubble question. It measures the relative supply of homes over time (relative supply is the current supply of homes compared with the current rate of demand). The thin yellow line shows an annualized view of the relative supply. A healthy market has 6.0 months of supply of homes. We refer to this as market equilibrium, a level of supply that gives neither the buyer nor the seller an advantage in negotiations. When the relative supply of homes falls below 6.0 months of supply, we refer to this as a sellers' market, as there are more buyers than sellers in the market. The opposite is true in a buyers' market when home inventory levels rise above 6.0 months of supply, as more sellers than buyers exist. Currently, there is just under 4.0 months of supply of homes for sale in Tallahassee across all areas and price ranges, meaning there is far too little supply of homes to meet the current rate of demand. And demand is rising! Our housing market is continuing its recovery, but there are not enough homes in 80% of the areas and price ranges (though luxury homes are still glutted) to satisfy demand from buyers. This is a problem for Tallahassee, but it is the opposite of a housing bubble. So if you are worried about a housing bubble forming in Tallahassee, you can relax. There is no housing bubble and the conditions are not ripe for another one to form any time soon. But if you are worried about the health of the Tallahassee housing market, then I must warn you that there is great cause for concern. When the supply of homes for sale is low and yet demand is rising, it is a call to homebuilders to bring more homes to the market at a faster rate. Unfortunately, this is not occurring in Tallahassee. The greatest demand for homes is occurring in the $100,000 to $300,000 price ranges, mostly on the North side of town. Unfortunately, the cost of construction is significantly higher than it was 12 years ago, and builders who do not have remaining "cheap" lots (ones that were foreclosed upon during the recovery) cannot produce homes in this range. So supply levels continue to fall, even as demand rises. We are seeing astronimically high rates of appeciation right now, and it is very possible that rates will escalate. Historically, we've measured annualized appreciation rates of roughly 3.5%, so these numbers are a real cause for concern. What Tallahassee needs is more new homes from our builders. To make this happen, we need to understand our roles. Lenders need to make loans, builders need to build, and the community needs to support them. How often do we see neighborhoods band together to try to stop development in areas that are aleady designated for residential development? They rarely succeed, but they delay the process by a few years and cause developments to be far more costly (thus raising the final cost paid by consumers for new homes). Now I'm not advocating for reckless development and I do advocate for property owners to raise concerns when zoning changes are requested, but simply banding together to slow the inevitable is only making it worse for all of us. And before you think that hyper inflation is good for existing homeowners, what do you think is going to happen when interest rates return to normal and buyers can no longer afford to buy homes at the higher levels? Our current market is built on mortgage interest rates that are current 1/2 of their normal levels, and rising rates will mean declining home affordability, a situation opposite but equally as troubling as a housing bubble. Homeowners who want to "move-up" will be crushed by higher prices, compounded with double the interest rate on a higher loan amount. Stifling! Homeowners who want to "move-down" will be unable, as the new mortgage payment on smaller, pricier homes will be higher than their current payment they are trying to reduce. Refinances for home renovations will be unwieldy, requiring homeowners to potentially double (or more) their monthly payments due to new mortgage interest rates. Utlimately, nobody wins if our market shoots out of the reach of most homebuyers in our market area. We need homes to be affordable at all levels, and to do this we must maintain a healthy balance between supply and demand. We need our builders building.